And just plain big! Designer Jeff Allis created and installed a delightful vertical garden with Florafelt for St. Andrews Country Club in Boca Raton, Florida. A vivid stroke of beaming red bromeliads creates excitement. Add to that their practical value – bromeliads are great at adapting to low moisture and low light conditions, making them ideal for indoors and out. Contrasted by green philodendrons, this tropical display is breathtaking. Jeff ‘s firm, Tru Vine Design, is well-known throughout southern Florida for exceptional gardens in homes, restaurants, boutiques, recreation destinations and more. He has explored hundreds of nurseries and botanical gardens throughout America, Europe, Central and South America, and it shows in his vibrant creations. Jeff Allis, Tru Vine Design. Chrome Hearts Miami. Florafelt Vertical Garden. 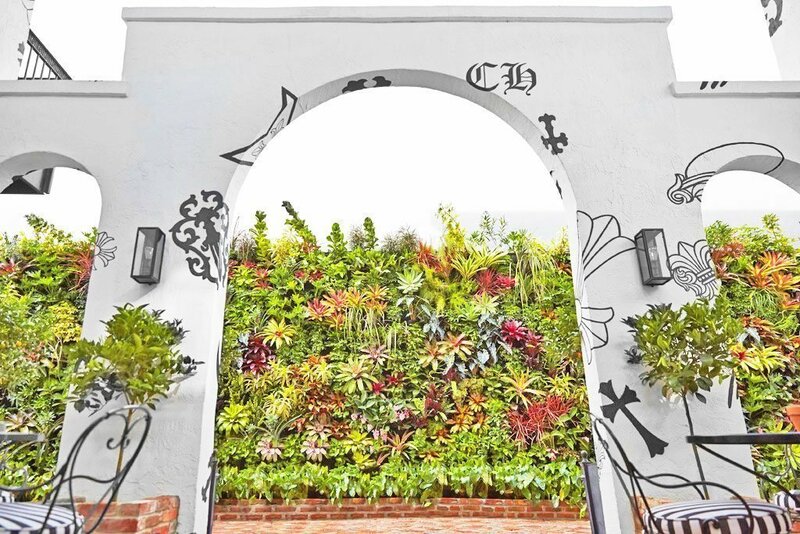 Check out his exuberant vertical garden for the Chrome Hearts cafe in Miami’s bustling design district. More than 1,000 tropical plants transformed the inner courtyard into an ultra-hip oasis. It features a sophisticated composition of exotic bromeliads.